They say they're talking about this now because they didn't have the energy to do it at the time, as they were dealing with the fallout. 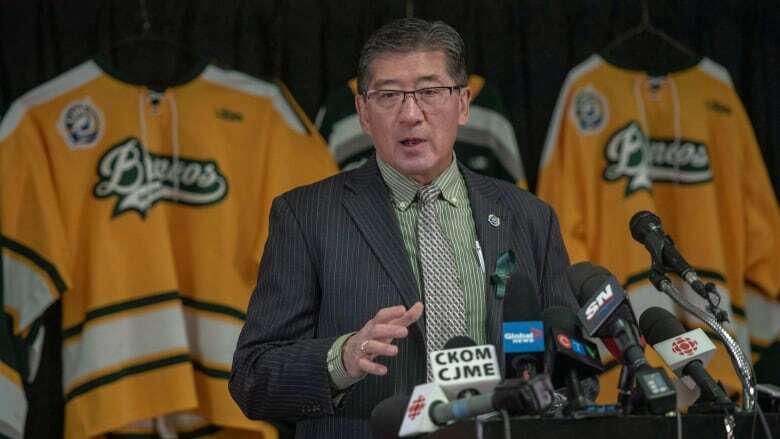 On April 9, 2018, just days after the crash that killed 16 people, Bill Chow stood in the Humboldt Broncos arena, team jerseys hanging behind him, to announce the SJHL Assistance Program. He said it would provide "mental health assistance, counselling and grieving for all the players of the SJHL" in the coming days, months and years. He told the assembled national media that if there was money left over, it would go toward the SJHL education fund "in the memory of the lives lost on April the 6th." For years, Chow has wanted to offer scholarships to help the league attract better players. As far back as 2014, in a post on the SJHLwebsite, Chow was quoted as saying he continued to "turn rocks over for new finances" in his quest to create a league scholarship. Chow told CBC News that if enough money was raised, "possibly a scholarship program would be created." Former Broncos treasurer Darrin Duell said he believes Chow was exploiting the team's tragedy, and he questioned Chow's timing. "It was disgusting and opportunistic," Duell said. "On Monday morning after a tragedy of the proportion of April 6th, to go and raise money for the league for your scholarship program — that is outrageous." He said Chow made the announcement without consulting or informing the team. In the wake of the tragedy, donations began pouring in from around the globe, and Duell believes Chow "wanted to get in front of that and take advantage of the fact that people were ready to donate." Duell said that from the beginning the idea of a multimillion-dollar fund for mental health made no sense to him. He pointed out that mental health supports were there from the start. The Red Cross was on the scene providing service directly to the families and had offered SJHL players a free online mental health self-assessment. In his opinion, the mental health focus of Chow's program was just window-dressing. "I was thinking 'He's going to spend a little tiny bit of money on mental health intervention to create some legitimacy around what he was doing, and then the bulk of the money was going to be used for scholarships,'" Duell told CBC News. The program raised about $2 million in donations. Chow says so far the program has spent $100,000 on counselling services and given $20,000 to the Canadian Junior Hockey League to help establish a national concussion program. Duell said the fact that just five per cent of the fund has been spent on mental health one year after the tragedy confirms his suspicions. "I felt right away that this was just misleading. Like, why would they need to raise [millions of] dollars for a league with less than 300 players?" said Duell. When he announced the fund, Chow anticipated some conflict. "We're going to make some decisions. Not everybody is going to agree. But as a group, as long as we think we have the right decisions made, that's what we're going to do," he said. Chow said it became clear to him that the tragedy would impact the entire SJHL for years to come, which would create additional costs. He said in light of that, it was important to immediately create a fund focused on those long-term needs. He noted that mental health problems like PTSD can take time to emerge and said the new program was "about building something for the future, so that when I get fired one day, there's going to be something here to make sure that everybody's taken care of, moving forward," he said. The tragedy had already sparked a flood of giving from people around the world. By the time of that Monday morning announcement, a GoFundMe account set up for the team and their families had already taken in about $5 million. That campaign ultimately brought in more than $15 million, making it one of the largest GoFundMe campaigns in history. Chow told CBC News the league considered taking it over when it became unmanageable for the Humboldt resident who established it, Sylvie Kellington. But he learned "there was no way that GoFundMe would allow that to happen." 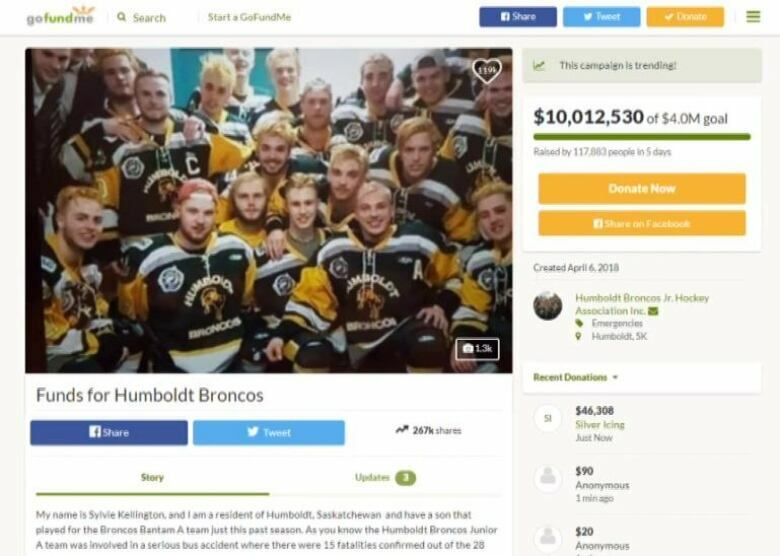 Chow said the GoFundMe account was set aside exclusively for the Humboldt Broncos, so he decided to establish a fund focused on the SJHL. The money started pouring in immediately. The main corporate sponsor of the program, Co-op, announced a large donation at the news conference. Co-op CEO Scott Banda also urged others to give. 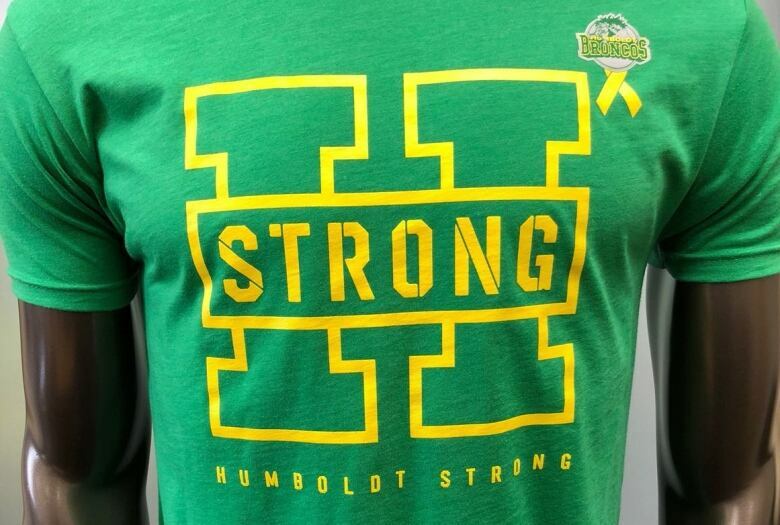 He said the fund was "a way to help many of our Co-op customers, our members, our families and anyone else out there who's looking for an outlet to show their support for the Humboldt Broncos and the SJHL as they recover from this tragedy." Chow also announced that Regina-based clothing company 22fresh had formed a partnership with the program and would be creating Humboldt Broncos clothing that would be sold through Co-op retail outlets, with proceeds going to the fund. Chow told the crowd he gave the Humboldt Broncos a heads-up before making this announcement. 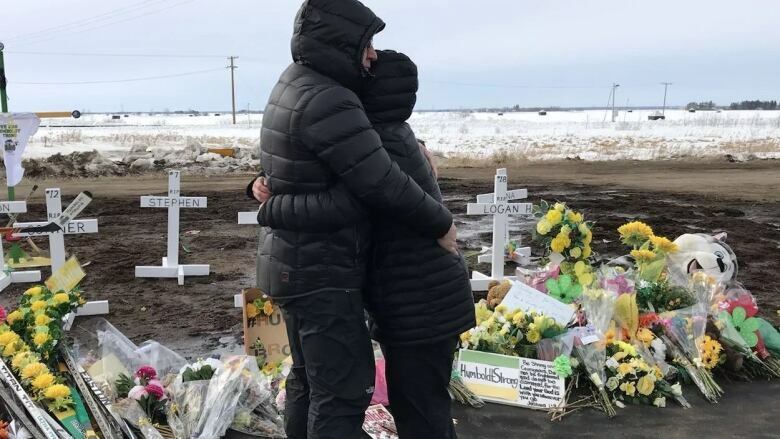 "I've had conversations with a few of the board members of the Humboldt Broncos, making sure that they understood what we were trying to do and this isn't a tug-of-war," said Chow. 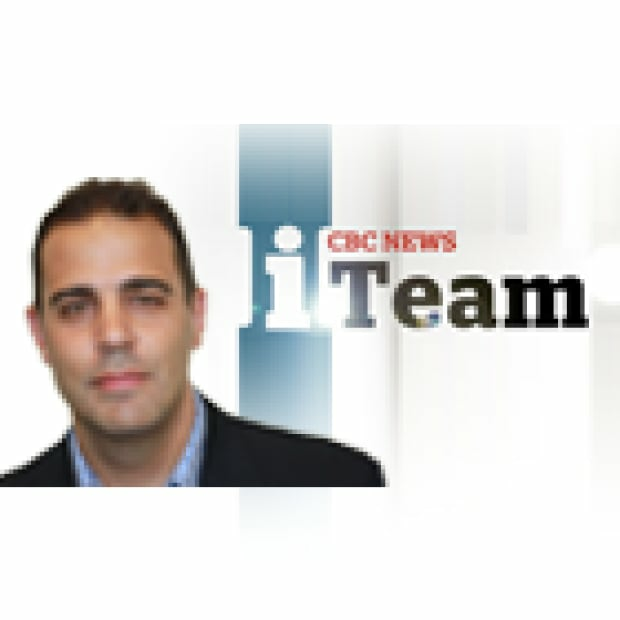 CBC News asked Chow by email which board members he spoke to and when. He replied: "Their governor at the time was Rob Eichorst." Eichorst confirmed to CBC News that he spoke with Chow but he disputed the SJHL president's characterization of that conversation, saying Chow asked only if he could make an announcement. "But we did not know what it was," Eichorst said. He said if he knew what the announcement was about Chow "would not have been on our stage with our jerseys behind." He said he doesn't oppose the idea of a scholarship for SJHL players, and agrees it would be good for recruitment. But he felt the the league rushing in to establish the fund was inappropriate. "We had funerals to go to and he was raising money." Duell said he is suspicious of Chow, in part because of another controversy he had with the league president in the midst of the fallout from the crash. A couple of weeks after the crash, Chow, on behalf of the SJHL, applied to trademark #HumboldtStrong and other phrases that had become associated with the tragedy. The team felt those trademarks should belong to them. Within days of a CBC News report about the dispute, the league's board of governors unanimously agreed to reverse the decision and transfer the trademark applications to the Broncos. Duell was right in the middle of that dispute. He said he called Chow and said the league had no right to use the slogan to fundraise for the foundation, and Chow told him it would have to be sorted out by lawyers. During the first few weeks of fundraising for the SJHL Assistance Program, all of the money was going into the SJHL's bank account. Chow said the fund was set up in a hurry and without much expectation or research. "I had no idea what those programs were going to cost, and I had no idea how much money was going to come in," he said. Then on May 15, about five weeks after the crash, a federal non-profit corporation called the SJHL Assistance Program Inc. was established to administer the funds.Chow was one of four volunteer board members and was listed as the president. He told CBC News he didn't ask the league's approval before he announced the creation of the program on April 9. He said the SJHL board has never had anything to do with the fund. Vic Huard, a VP with Co-op and one of the other directors of the fund, said it was always the plan to create a separate, independent organization. "The SJHL board has never approved or disapproved of this organization and its existence," Huard told CBC. "It's not for them to say. It's an independent, federally registered not-for-profit organization completely independent of the SJHL." Huard acknowledged it's a bit unusual that for more than a month, money donated to this fund was flowing into the SJHL bank account but he said "we needed to put the money somewhere other than in my sock or my wallet." He also acknowledged that the name of the fund, the SJHL Assistance Program Inc., may give the impression that the two organizations are somehow connected. "We basically had to have a name for the announcement," Huard said. "But we are looking at renaming the organization to more accurately reflect the scope well beyond the SJHL." The SJHL Assistance Program Inc. incorporation document fleshes out more detail about the fund. It says one of the key purposes of the program is "to advance and promote sport by providing publicly available scholarships, bursaries and other forms of financial assistance to past, present and future players of the SJHL, originating from any region in Canada, to be used for post-secondary or vocational education." Huard told CBC News that the board decided in December to open the scholarship program to all Junior A hockey players across Canada, not just those in the SJHL, and that the scholarships would only be for players wanting to go into mental health related professions like psychiatry or counselling. He said because people across Canada donated, "it's incumbent on us to broaden the scope of the scholarship to include players across Canada." He said he also got that message from colleagues. "As we began our conversations with our Co-ops across Western Canada, one of the things they said was that's great but you know we've got a partnership in Dauphin [Manitoba] with the local team, we've got a partnership in Kelowna [B.C.] with the [Kelowna] Rockets," Huard said. "Is there a way to expand this out? And we said, listen, we're going to try to figure this out." When questioned whether it was appropriate to change the scope of the program in this way, given the stated purpose of the organization when the fund began, Huard said it's not a problem because everyone knew that in the early stages the program was being presented in "broad brush strokes." After the initial publication of this story, the father of one of the players who died in the crash reached out to CBC in an e-mail, saying he supports the scholarship fund. "I have to agree with Mr Huard. The 3 pillars and scholarships in study for mental health is wonderful," said Toby Boulet, father of Logan Boulet. Chow disputes Huard's characterization and says no final decisions have been made and he still believes an additional scholarship program just for the SJHL will be possible.